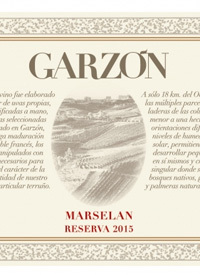 Garzon, Maldonado, San José, UruguayThis is 100 percent marselan, a red grape that is a cross between cabernet sauvignon and grenache first bred in 1961 near the French town of Marseillan in the Languedoc region of Hérault. Low yielding, this has good disease resistance to botrytis, powdery mildew, coulure and mites. At Garzón it reveals a wild blackberry, black cherry and black plum nose lifted with a flush of bright acidity and framed by a house of thorny, youthful tannins. There is a lick of eucalyptus that flirts throughout to a drying finish. Rustically framed, but elegantly presented, this is an ideal wine to serve up with fire grilled beef.Tasted: 05 March 2017Tasted by: Anthony Gismondi and Treve RingPrices: CDN	24.25	estimated retail Producer: Bodega GarzónDistributors: Renaissance Wine Merchants Ltd.